Posted by A few months back LL's birthday, we hit up Cafe Bicyclette for dinner. Its located on the lower level of the building, with a convenient parking lot right next to it. What a difference a bit of paint does - the space is brighter and seems more open than the previous restaurant Bistro la Persaud, transforming the sombre and dimly lit interior to a welcoming rustic bistro. Onto the food! Service was prompt and friendly - they didn't have an English menu, and while we had fun dredging up the remnants of several years of French classes years ago while we waited for the rest of the table to arrive, the waitress patiently translated the menu for our whole table. We ended up ordering most of the items on the menu, but I didn't take pictures of everything.. just plates that were within easy reach (I was feeling lazy that day). 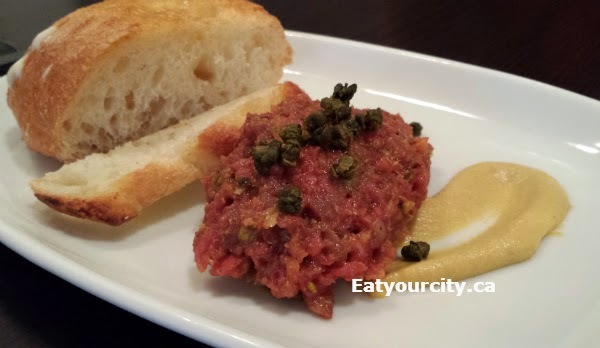 The Beef tartar was a generous portion served with some olive oil drizzled crostinis. The tartar itself was nicely seasoned, if a bit heavy on the salty tangy capers... easily solved by scraping off and discarding them. Perfect for sharing, though we did have to ask for more bread. 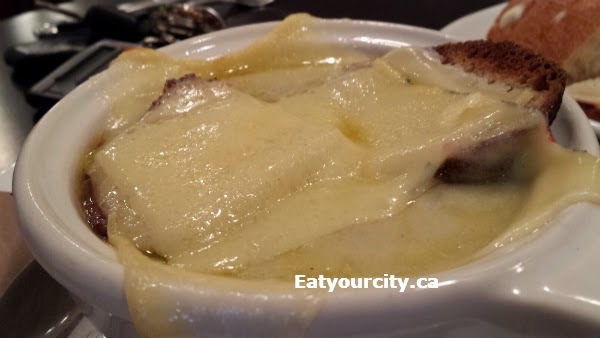 The French onion soup was delicious with lots of sweet caramelized onions that added a perfect balance of sweet to the salty savory broth. 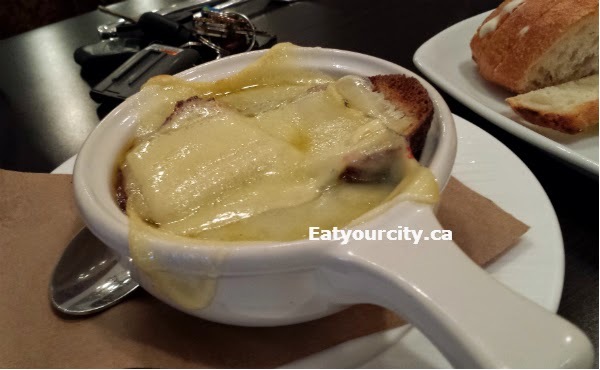 While my boyfriend's bowl had a nice thin pieces of toasted cheesey bread that incorporated into the soup well, others at our table had their bread sliced too thick which detracted from the tasty soup as it was impossible to break through it with a spoon and was too thick to soften up into the soup. 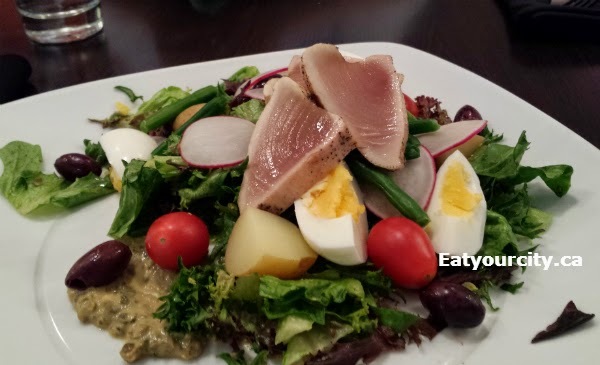 The Tuna Nicoise salad was beautifully presented with usual raw tuna, soft boiled eggs, potatos and greens. The tuna while nicely seared, was a bit on the fishy side - they should strongly consider using sashimi grade tuna in the future. I was expecting an anchovy based dressing, but they had a tasty capers based one instead. Next time I'll ask for the dressing on the side - though the dressing was thick and tasty, it was also very very salty and anything the dressing was tossed onto was overwhelmingly salty... luckily the dressing only adorned a quarter of the salad. 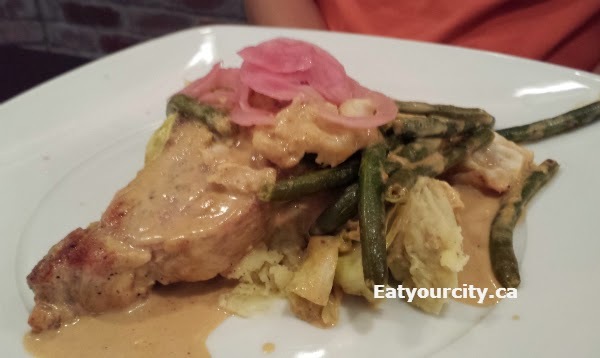 The Pork with apple purée and mustard sauce had a bit of a muddled presentation and a touch overdone, but was a tasty combination of simple flavors. The Coq au vin or chicken braised in a generous amount of red wine, was executed well and tasty though the chicken and veggies was swimming in a super caramelized dark brown sauce (maybe it was the dim lighting as the evening grew late.. no pic sorry!). 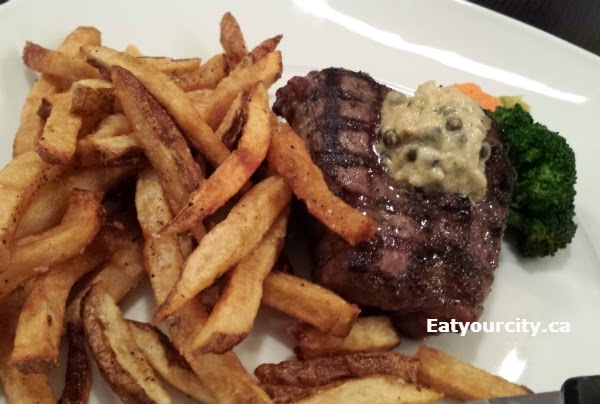 The Angus au poivre, legumes et frites or steak with pepper sauce with veggies and fries was executed well except for the sauce. Traditionally, the steak should have been encrusted with peppercorns and then bathed in a cream based sauce. Cafe Bicyclette's version had the steak was cooked to my liking and lightly seasoned with salt and pepper, along with a ball of pepper cream "sauce" on top. The scoop of sauce was quite overly thick and studded with whole peppercorns - it could have used a lot more cream and far less roux... 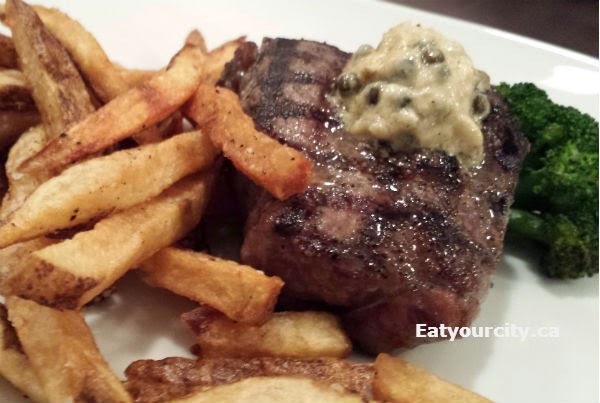 I ended up scraping it off to the side and enjoyed the steak and fries as is. 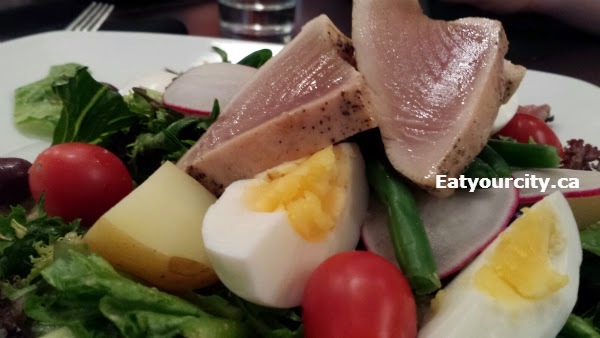 There's promise and potential here, and though the food was a bit hit and miss, if the kitchen focuses on consistency, refining their dishes, and a more careful hand with salty ingredients, it'll make its own little niche in the Edmonton food scene. I'll likely head back for their simple brunches and give them some time to improve before giving their dinner menu a whirl again.